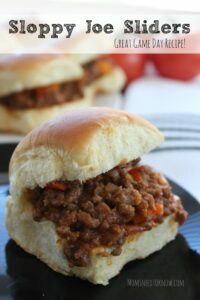 This Sloppy Joe recipe is so easy to make and one of my favorite "comfort foods". Perfect for Game Day, dinner or parties! Brown ground beef. Drain beef and make sure that most of the grease is out of the skillet. Return to skillet. Add peppers, ketchup, mustard and water and cook for another 15 minutes until most of the liquid is reduced and sauce is thick. Split rolls in half and place on a cookie sheet and in the oven for a few minutes to toast lightly. Serve Sloppy Joes on toasted rolls.